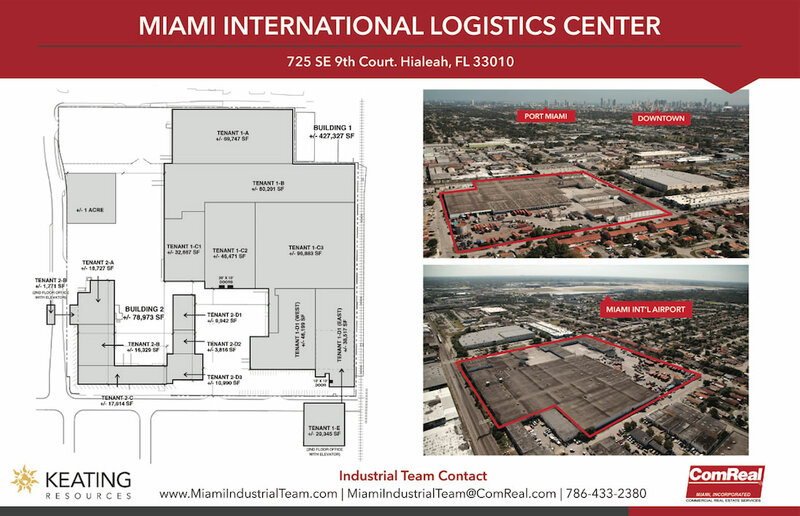 Miami International Logistics Center is located at 725 SE 9th Court in Hialeah in the Airport East sub-market. It is one of the closest warehouse distribution centers to both PortMiami and Miami International Airport. The 506,000 sq. ft. warehouse building sits on twenty acres. The Hialeah warehouse spaces for rent are from 3,000 to 80,000 sq. ft. and up. Some of the property’s features include: dock height loading, 24/7 security, CSX railroad (can be activated), fully sprinklered, outside storage, and more. Current tenants include Alsina Forms, Dupuy Logistics, Mandarin Orange and Interport Logistics. The property is owned by Mr. Gerard Keating of KR Miami. Short term leases may be considered making these warehouse spaces ideal for overflow and/or dead storage. For more information and/or a tour, please contact the leasing team: Ed, Chris, or Edison at 786-433-2380.